Biographical sketch, "To the People of the Second Supreme Judicial District: Notice of R.E. Carswell, of Decatur, Texas," "as a candidate to fill unexpired term of Judge I.W. Stephens as Associate Justice of the Court of Civil Appeals of said district," 6/12/1908, p. 1. Born in Georgia in 1853, served in 29th-30th Legislatures from Wise County. Wise County Messenger. 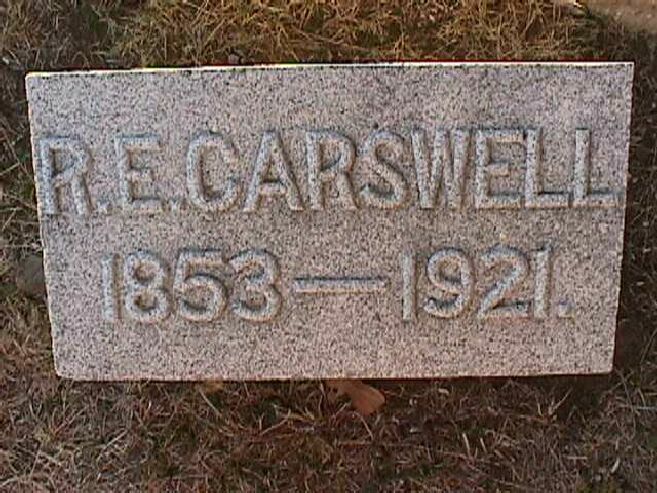 Robert E. Carswell, birth date 2/10/1853 in Georgia, death date 8/1/1921 in Decatur, Wise County, lawyer. FamilySearch Texas Deaths, 1890-1976. 29th Legislature (1905) - R.E. Carswell, postoffice Decatur, nativity Georgia, age 51 (born circa 1854), lawyer, Democrat. Texas Legislative Manual. Grave marker, R.E. Carswell (1853-1921). Wise County Cemeteries, 2001. Obituary, "Jurist and Good Citizen Dies Here: Robert E. Carswell, One of the State's Most Prominent Lawyers, Is Gone," 8/5/1921, p. 1. Born in Georgia, 2/12/1853; "Wise County's representative in the legislature for two terms." Death date Monday, 8/1/1921. Wise County Messenger.